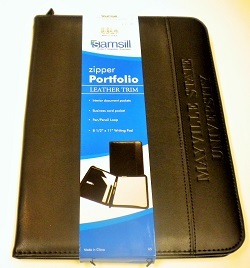 Zipped portfolio with a debossed Mayville State design from SAMSILL. 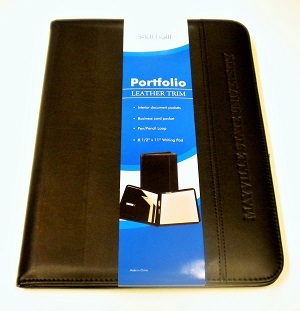 Leather Portfolio with an embossed Mayville State University design from SAMSILL. 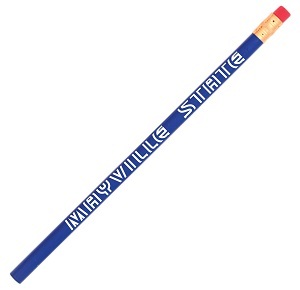 Wood pencil with a Mayville State design in white. 7" w x 3/8" printed lace key strap with split ring from SPIRIT. Detachable lanyard with an imprinted Mayville State design from SPIRIT. Please select option for LANYARD SPRING 2014. 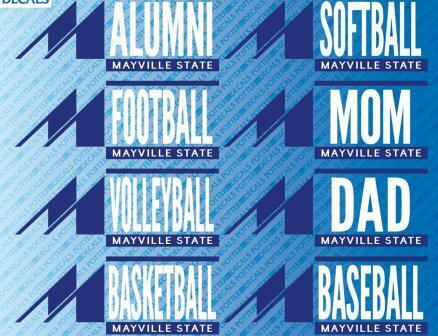 Inside application vinyl transfer decals featuring Mayville State Alumni, Baseball, Basketball, Football, Softball, Volleyball, Dad or Mom. Please select option for DECAL/VINYL TRANSFER.